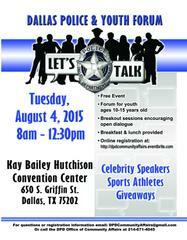 On August 4th, the Dallas Police Department will host “Let’s Talk”, a forum for youth ages 10 to 15 years old. The goal of the event is to encourage open dialogue between youth and police department representatives. Let’s Talk is a platform in which young people will be able to speak freely with officers and other police department personnel, and gain information on how to interact with law enforcement. Let’s Talk will be held Tuesday, August 4, 2015, from 8 a.m. – 12:30 p.m. at the Kay Bailey Hutchison Convention Center located at 650 South Griffin Street. There will be celebrity speakers, sports athletes and giveaways. Lunch is provided for the participants, and there is seating available for parents who would like to stay for the event. Paid parking lots are available in the immediate area. Please see the registration link below, along with the flyer.